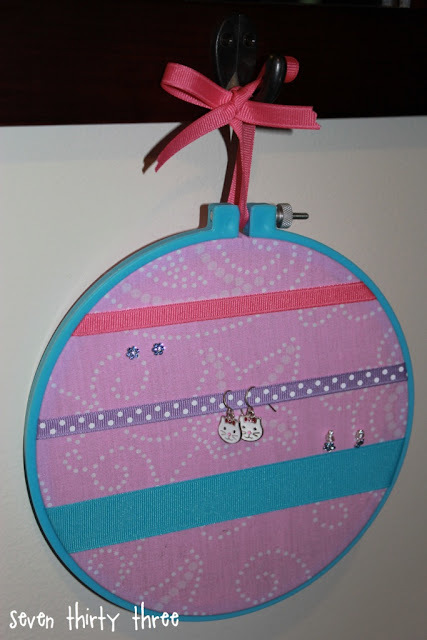 Hi to all you crafty ladies out there! 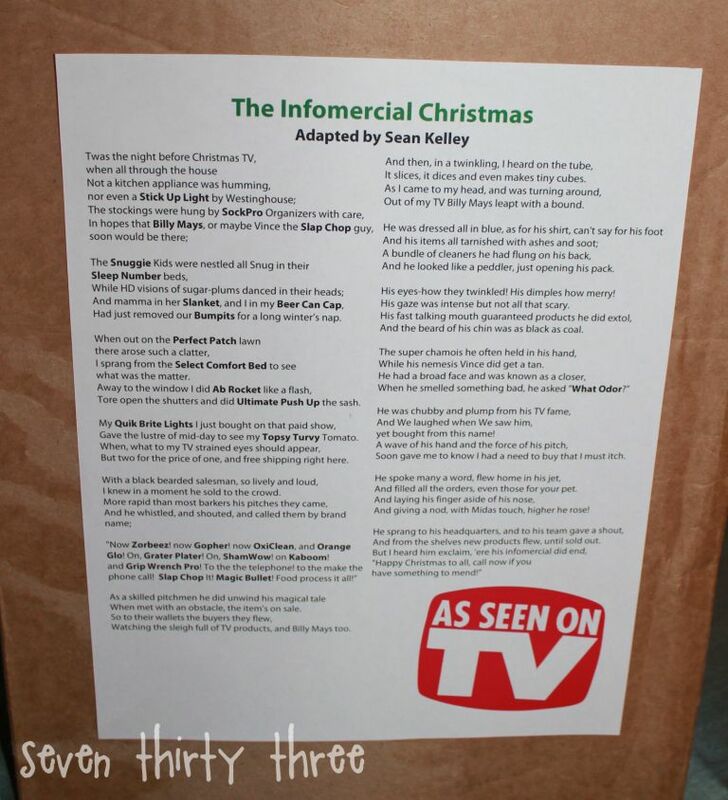 I am Kim from seven thirty three and I am super excited to share one of my families Christmas traditions with you. 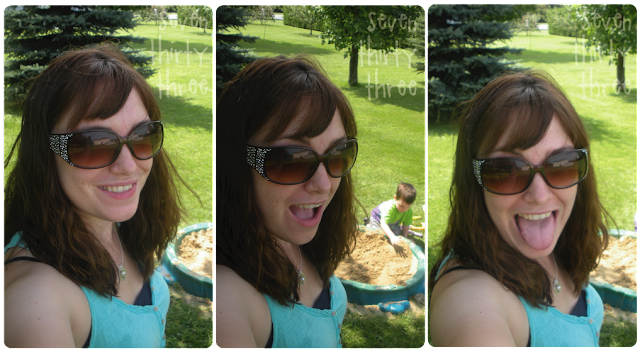 But first, I would like to take a minute to introduce you to my blog! So what am I planning for this year? 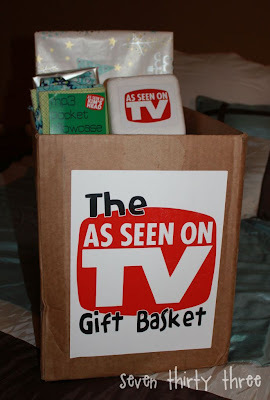 The As Seen on TV Gift Basket, of course! Originally I was going to do a camping theme, which is why these two items have tags I created... I'm faking the theme here, but I already created the two items, so used them. 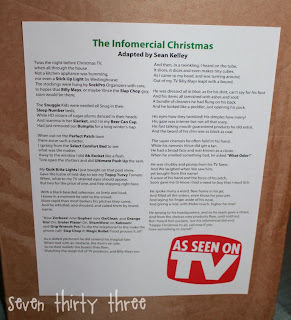 I also found this great poem - The Infomercial Christmas - a parody of 'Twas the Night before Christmas, that I am adding to the box. Look it up, it's a good laugh! The best thing about this basket . 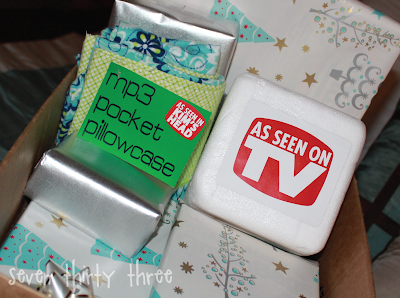 . . you can find As Seen on TV items EVERYWHERE. All the major retailers have endcaps filled with these items. Even my grocery store had a full section. Of course this basket wouldn't be for everyone, but I know my Uncle's family will love it. That is the best part of this whole tradition - putting a lot of thought into a really fun gift for the family. The last part of our family tradition is an ornament exchange. Each individual brings an ornament to the celebration. We hang them on the tree and then going by age each person picks an ornament to bring home. Last year we decided to turn it into a Yankee Swap and it was a blast. Anyone 10 and older had the chance of having their ornament swapped! I remember so much from that night, and I know my kids do too. They have already started to ask when we are going to Aunt Reney's for the fun party! We have other traditions as well, just among my immediate family. Every Christmas Eve we go to the in-laws and eat a nice turkey dinner and open gifts. Christmas morning is reserved for just my hubby and kids and we stay home all morning until noon, when we head to my parents house (6 houses down!) to eat brunch and open gifts with my family. After a few hours we head back home so that the kids have the rest of the day to play. My MIL and FIL come over and we make homemade pizzas and visit. I love Christmas time. Getting together with family and friends, good food and drinks, the spirit of the Holiday and teaching my children about giving. I wish you all a happy and safe Holiday Season! Thanks Kim! These family traditions sound like sooo much fun! Link up and tradition on! omgosh, that is such a great idea (family gift). I'm going to suggest this to my mom. I absolutely love this idea!!!! 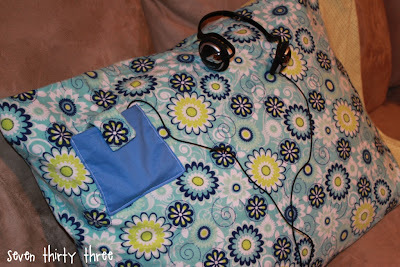 I just read this whole post to my hubby outloud poor guy haha. Thanks for the great idea Kim!! Thanks again for having me Elizabeth! I have to keep this idea at hand for future use!! Do you have a link to print the "as seen..." label? I would love this idea for an auction fundraiser. thanks!